DeatschWerks knows the amount of money and hard work that goes into building the amazing vehicles on display every year at SEMA. Most of the vehicles are not backed by deep pocket sponsors, but instead by enthusiasts sacrificing blood, sweat, tears… and a lot of money to one day get their build on the SEMA show floor. So for all this hard work and dedication, DeatschWerks will support these vehicles with product credit and cash of up to $500 for displaying one of the official DW logo options. DeatschWerks hopes this support will ease some of the burden of what it takes to get a vehicle all the way to Las Vegas for the show. Application must be submitted to DeatschWerks by Oct 17th to allow enough time for approval and shipping of decal. DeatschWerks will notify approval by either phone or email within 72 hours. 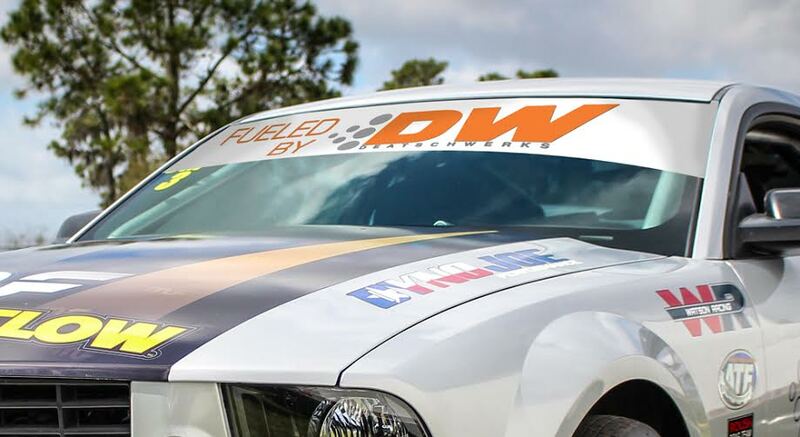 The window visor needs to be placed on the front or rear window and will be provided by DW prior to the SEMA Show. There is a limited quantity of these window decals, so this option will only be available while supplies last. Must be placed in a visible area and not hidden or out of view. This options allows for a provided 18 in x 5.25 in decal that DW will send out to you before the 2016 SEMA. Must be placed in a visible area and not hidden or out of view. Cut your own vinyl with whatever color that works best with your car. The proportions and graphical elements CAN NOT be distorted. Must be placed in a visible area and not hidden or out of view. Don’t have a DeatschWerks fueling product installed on the vehicle yet Don’t worry, DeatschWerks can help with that too. There is a place on the application to inquire about product sponsorship if the vehicle is not yet DeatschWerks equipped. *DeatschWerks is not making any arrangements for vehicles to be displayed at SEMA. The Co-op branding program is for vehicles that are already going to be on display at SEMA under their own arrangements.